To me, much more effective in making the point…besides it’s RAY LAMONTAGNE. While it’s difficult to touch the greatness that is Gladys Knight & the Pips, Ray LaMontagne recently got pretty close with a song that’s very reminiscient of it’s namesake title. Ray blends a little soul, solid R&B beats, and some pretty awesome horns that rival the original soul staple. Ray’s song is a bit more joyous, while Gladys’ is more melancholy and desperate. Both still fit the bill. 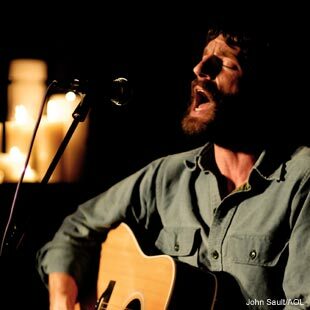 Ray LaMontagne is as brilliant as any artist that has ever lived. And he’s getting better; tighter, more focused, more self-assured. That’s pretty high praise coming from the Music Messiah. Actually, Ray opened for him at The Fillmore in 2005, so John has known of Ray for a while now. But just recently, John decided to blog about Ray L. recently and tried to explain Ray’s “essence” by creating an iTune’s iMix to showcase Ray’s obvious talent and compel others to get “caught up” on Ray. With baited breath, I clicked into iTunes to check out what Ray song’s that JOHN MAYER thought captured Ray. Wow, JM, you really dug deep for those. Aren’t these all ones that have been on TV or in the movies? While I give John props for the iMix thing, I don’t think those three songs capture the multi-facetedness of Ray LaMontagne. While I think that visuals like YouTube vids give a better glimpse of the complexities of RL, I am intrigued by the whole iMix thing and thought that it would be fun to create a Ray LaMontagne MusicMaven iMix that I think better captures the essence, range and profound talent of this prolific artist. I do agree with John, however, that Ray is really starting to come into his own. His latest CD, Gossip in the Grain, is markedly more upbeat than Trouble, and ‘Til the Sun Turns Black. However, in Ray’s initial, self-produced CD, One Lonesome Saddle, includes some really good stuff, with a spectacular old-time religion track of Shuckin’ the Corn, he shows that even when he first started out, he had diversity in his music and passion in his heart. Absolutely marvelous. Movin’, groovin’, and definitely NOT Country, Ivory. Ray’s music covers so many genres, that he’s hard to “label”. However, give it a shot. Give me a genre label for Ray’s music…like “Diversified Soul” or “Angst Funk”. Well, this is not exactly what I had planned for the Labor Day weekend, but here we are….again. As I explained in my Tropical Storm Fay post last week, we are “stayers” so we’ve made our preparations, stocked up on supplies, lanterns, gas, ice, beer, and wine. (Believe me, as the storm draws near, the latter is a necessity.) While Mobile will not get a “direct hit”, we are on the right or the “wrong” side of the storm where the storm surge and rain bands are the worse. We’ll likely lose electricity so I may not be available for a while. However, the real issue with this storm is New Orleans. 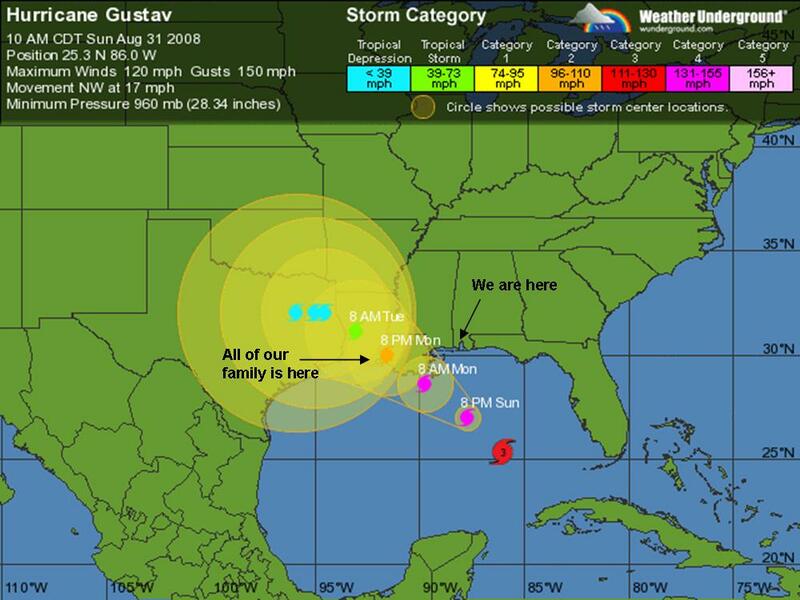 Gustav is predicted to make landfall just west of New Orleans, putting the city and Lake Ponchartrain in the path of the Eastern eye wall, which is the absolute worse place to be. 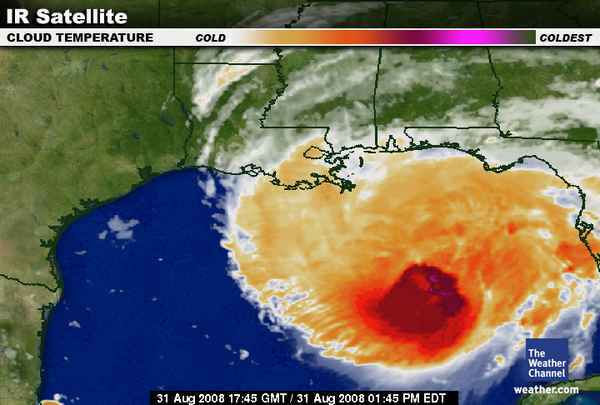 In my opinion, this storm will be worse on New Orleans than Katrina. This storm could very well break the back of a city that has experienced such wide-spread suffering. Even though residents know that New Orleans is basically a “bowl” and the levees will fail if strained at all, the shock of seeing damage from 20 ft. of water is just not something you get used to. If this storm plays out like it looks to, New Orleans may very well never recover. Most of our family is in Lafayette and New Iberia (which is west of New Orleans and Baton Rouge) and most are staying put. Those that live in low lying areas are bunking in with others and are basically safe. It appears that they will experience the immediate Western side of the storm, which will likely not be too severe. One son stayed in Lafayette and the other evacuated here and is staying with us. We’ll stay in phone contact with everyone as long as land lines and cell towers hold out. Thanks for all of the thoughts and prayers. They are needed and appreciated. We will be fine. We always are. Last June, I did a post on Live From Abbey Road, on The Sundance Channel and the fact that Ray LaMontagne was one of the sessions. I happened to be exploring and came across Ray’s session again. Ray is akin to Thursday to me so it just seemed right for a Thursday post. You know, latter part of the week so you’re counting down to the weekend with much anticipation, but still in work mode enough that you can’t relax just yet. Ole Ray is still whack but I’m drawn to him like a moth to a flame. What is it about his Ted Kacynzki manner that I like so much? This interview is a prime example of the dichotomy that is Ray LaMontagne. Perhaps it’s his obvious vulnerability or maybe it’s just his passion of the music. It could be that he’s just so unpretentious. Whatever it is, I keep coming back. From the BBC Four Sessions performance…. Happy Thursday, Ray. Oh, and you too, guys.